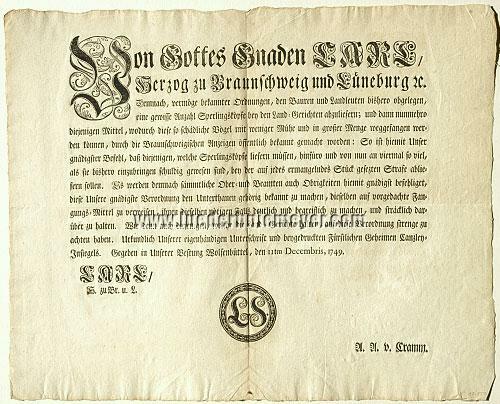 Decree of Charles I, Duke of Brunswick-Luneburg (1713-1780, ascension to the throne 1735, nephew of Emperor Charles VI and brother-in-law of Frederick the Great, founder of the Collegium Carolinum) concerning the increase of sparrow heads to be submitted. Published Wolfenbüttel December 11, 1749. 13 × 15¾ in (33 × 40.1 cm). 1 page. With large woodcut initial. With the ducal signature printed together with the L(oco) S(igilli) stamp and that of the minister A. A. v. Cramm. of unused freshness. Only in the outmost white margin two pinhead-small holes at the centerfold. – Typographic (I C M) + figurative (knight?) watermark. – On Charles see Allgemeine Deutsche Biographie XV, 266 ff. “ … for now those means by which those pernicious birds can be catched with little effort and in great numbers have been made known publicly by the Brunswick gazette: So … those who have to deliver sparrow heads … shall deliver from now on four times as much as … till now …” and the civil servants are urged “to refer to the mentioned means of capturing (and) if necessary to make them clear and understandable”. (Konrad Adam as analogous example on canalizing the Rhine in Frankfurter Allgemeine Zeitung of Jan. 25, 1995). And in his “Material on the ‘Pest Animal’ Combat in the Brunswick Country (17th/19th century)” in the commemorative publication Lindner – Et Multum et Multa, 1971, pp. 177 ff. Hans Kumerloeve calls things like this “the extinction campaign for reason of state” which continued, “here as in other German countries” where Frederick’s insight was not last resort, still into the middle of the 19th century, and locally even beyond and called forth “unimaginable proportions” (Kurt Lindner). Just as already Brehm proved for Prussian’s sparrows. Of especially effective typography + with untrimmed wide margins .